It has been centuries ago since our country had experienced the freedom it has been longing for. It has been a palpable moment in our national events, which we used to celebrate yearly. Thus, we, in Cagayan de Oro, we observed this celebration also. It is an evident to all of us that our city is also acquired and still partake this independence. All of the learning institutions here in CDO were in one theme with this event last Sunday, June 12, 2011. One of those establishments also, which joined the celebration was the SM Mall. I went to the area yesterday and observed how different people in different tribes or races, as well, who spent their time at SM Mall. 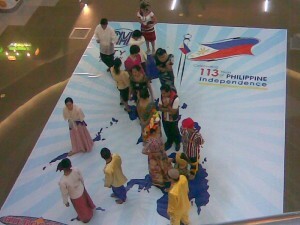 The SM management organized an event there for the said celebration and had put a big Philippine map on the rotunda area. There were also on costumes people on every Philippine area or province she/he is representing with. That is to show to all of us that, regardless of which race/s we came from, we are all Filipinos in blood, faith and culture as a whole. We also here in CDO, we are having that freedom and realization. We also have that freedom of being not only Cagay-anons in CDO or Cagayan de Oro, but also CDO in heart and faith that- Christ dominating on us. That what makes our City of Smile more abundant in wealth, riches and good fate in terms of architecture, businesses and fame in any ways! We would like also to inform or remind every Cagay-anons for our Foundation Day, which is fast approaching! See you on this successful event would be!